This round monogram stamp can be personalized with your name, address and your individual monogram or image. You will find this monogram stamp very useful to stamp envelopes, letterheads, cards, invitations or just use it as a return address stamp for your documents. 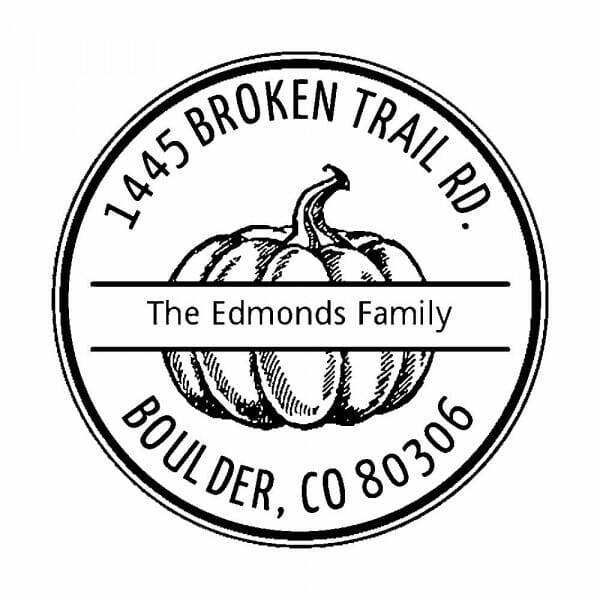 The Pumpkin Farm Round Monogram Stamp consists of a self-inking stamp (Trodat Printy 4642 round text stamp, 1 5/8" diam.) with a replaceable ink cartridge for thousands of crisp impressions. Use our design wizard to customize your personal monogram and return address stamp online. You will see an exact preview of the impression to be sure your monogram stamp will look as expected. You can choose from many different fonts and make changes to the selected template. If you already have a layout for a monogram stamp, you can use the upload function to send the design. Customer evaluation "Pumpkin Farm Round Monogram Stamp"